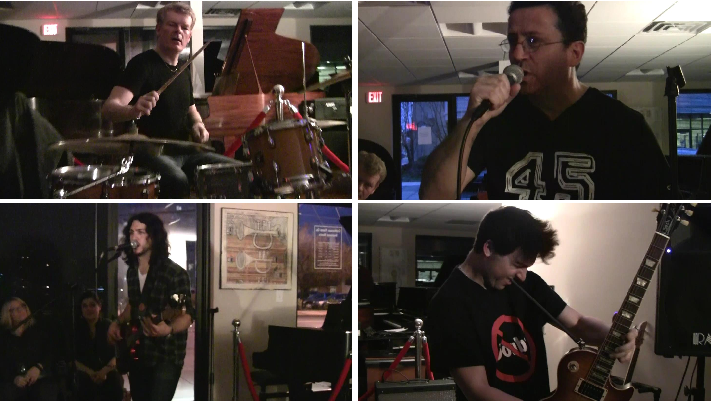 Left to Right, Top to Bottom: JP Chauvet, Jean Safar, Alex Cano and Nick Sochan at a debut concert in April 2016. Alive is a rock band born in 2015 when two French software engineers living in New York, JP Chauvet (drums and CTO at Deutsche Bank) and Jean Safar (vocals and Chief Architect at Calypso Technology), decided to take their musical hobby to the next step. Joined by accomplished musicians Alex Cano (bass) and Nick Sochan (guitar), they formed Alive, a rock cover band performing songs from David Bowie, Nirvana, Stone Temple Pilots, Prince, Jimi Hendrix, The Beatles, Pearl Jam, Guns n Roses, Red Hot Chili Peppers, Radiohead and REM.